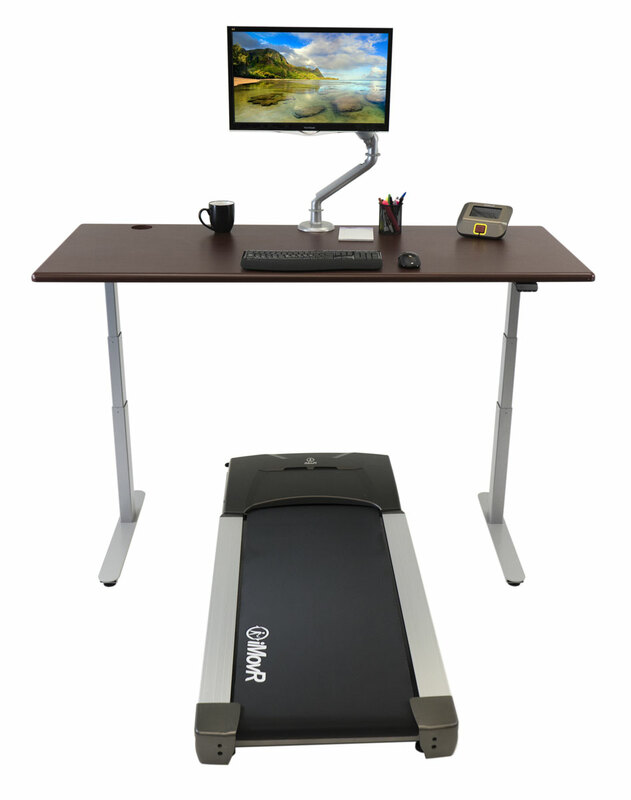 A treadmill desk is a desk that features an under-desk treadmill so you can walk while simultaneously performing tasks at your computer. Treadmill desks are ideal ways to reduce your sedentary time at the office, and many users report increased focus, attention, and productivity while walking. 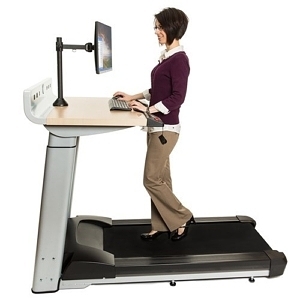 There are 2 components to any treadmill desk, the adjustable-height desk and the treadmill. In this review, we compare all integrated treadmill desks that are sold as a desk and office treadmill base combo. When you’re shopping for a treadmill desk, keep in mind they are like stereo systems—you can mix and match components, or you can buy an all-in-one system. If you’re more of the DIY type and want to build your own walking workstation, check out our reviews of the Top Standalone Office Treadmill Bases and Top Electric Adjustable-Height Standing Desks. These ‘best of’ lists are great places to start. If you’re looking for an all-in-one system, you’ve come to the right place. In this roundup, we look at integrated treadmill desk workstations—systems that pair a desk and treadmill together. Some manufacturers, like Steelcase, InMovement, Proform, NordicTrack and Exerpeutic, only offer their treadmill desks as combined workstations, with desk and treadmill. Other vendors offer their treadmills for sale either standalone or coupled with a desk. LifeSpan, TreadDesk, and Rebel Desk have one or two desk options available with their treadmills, and iMovR offers several different desk-treadmill combos. Office treadmills vary wildly in quality. Steelcase’s model no longer justifies the Walkstation’s exorbitant price tag. The Lifespan TR1200-DT3 and TR5000-DT3 walking treadmills, based on the brand’s running treadmills, have long been the popular choice but now face stiff competition. iMovR’s all-digital, state-of-the-art ThermoTread GT—a product we at WorkWhileWalking had a hand in developing—is the first and only office treadmill built for the office environment and features unique capabilities not available in the earlier generation of treadmills like a touch screen, LCD console, and cloud connection options; but it comes with a price to match its quality. Since we get a lot of questions about it, we’ll toss in here that there is no such thing as an Ikea Treadmill Desk, despite the buzz among DIY enthusiasts on the internet. If you are looking to hack together your own treadmill desk workstation from a cannibalized running treadmill and something like an Ikea Bekant Standing Desk, be sure to read our DIY Guide on How to Build Your Own Treadmill Desk, and our DIY Guide to Standalone Adjustable-Height Desk Bases. With the sheer number of choices available to treadmill desk workstation consumers, it can be daunting to find the right one. That’s why we’ve done the leg work to compile the specifications and create apples-to-apples comparisons of the different products in the market today. If you want to learn more about our review process in general, visit our Anatomy of a Review primer. But without further adieu, let’s get into the product categories. Why make this distinction over the addition of a seemingly minor accessory? After years of working on treadmill desks, we’re convinced that typing ergonomics is the most oft-overlooked aspect of a solid integrated treadmill desk. Working without an ergonomic keyboard tray is potentially hazardous to your health. While walking and typing, it’s almost unavoidable to brace your palms on the edge of your desk for stability. Do this often enough, and you’ll quickly develop wrist problems (as our more tenured treadmill deskers know). The solution is to angle your typing downwards so that your wrists rest naturally and you neutralize any ‘anchor stressing’ pressure on your palms. The best approach we’ve seen is to build a tilting keyboard tray into the tabletop itself. You lose some desktop space, but you’ll make it all back in terms of typing stability. That’s exactly what we advised one brand, iMovR, to do when developing their tabletops for treadmill desks. We hope more brands will follow their lead in the future. The first generation of treadmill desks generally combined a converted running treadmill with an adjustable height standing desk. While these fledgling workstations did the important work to start the active office revolution, they were not ergonomically-sensible. They left a lot to be desired in height reach and stability, with some models displaying a tendency to get very shaky as soon as the user started walking or touching the keyboard. 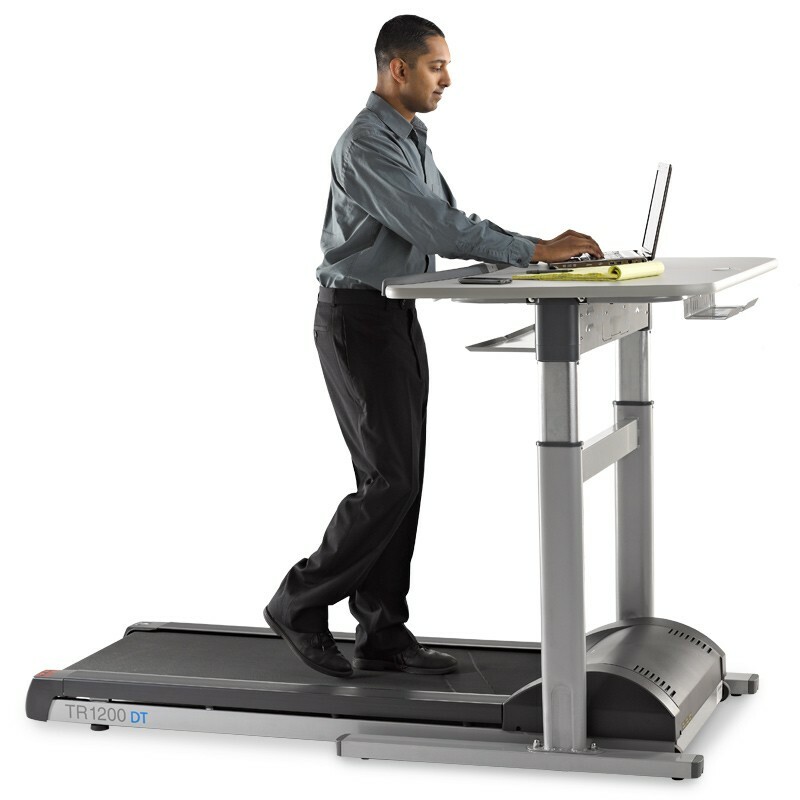 We’re now solidly in the second generation of the treadmill desk industry with desks that were designed specifically for the ergonomic requirements of a walking computer user. Select iMovR desks are the only models on the market that feature a built-in keyboard tray (SteadyType™) that allows users to assume the proper ergonomic position while walking and working to avoid strain of the back, neck, shoulder, and wrist muscles. These SteadyType-equipped desks are rock solid, where other two-legged standing desks can be quite shaky, especially if those other desks have an ergonomic keyboard tray that increases the “moment lever” on the fulcrum. Watch this video for a demonstration of the difference in stability between an SteadyType™ desk and any other two-legged adjustable-height desk. In the quest for achieving the most neutral posture possible, keep in mind that conventional ergonomic keyboard trays were designed for sitting users, and thus only go to -15° of tilt adjustment. However, the highest typing productivity, greatest comfort, and least exposure to repetitive strain injury are known to be achieved at keyboard tray tilt angles of -30° to -45°. 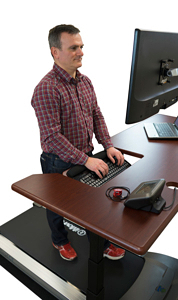 These SteadyType-equipped desks can hold onto their keyboards even at extremes of up to -85°of tilt and are typically used at 20° to 35° when standing, or 30°-45° when walking. Such angles simply cannot be achieved by conventional under-desk mounted keyboard trays. Furthermore, conventional keyboard trays can’t even be mounted on the vast majority of standing desks because the crossbars of the desk frame interfere with the slide-in rail of the retractable keyboard tray. Hence the novelty of the SteadyType tray, and why these products get their own grouping in this comparison review. The following products are listed in order of their respective Experts’ Ratings, from highest to lowest. Cons: High price to match the quality, you may want to re-situate the height controller to keep from accidentally bumping it. Pros: The Cascade is a 100% American-made quality desk, and the ThermoTread GT is the most state-of-the-art office treadmill made today (manufactured in Taiwan). 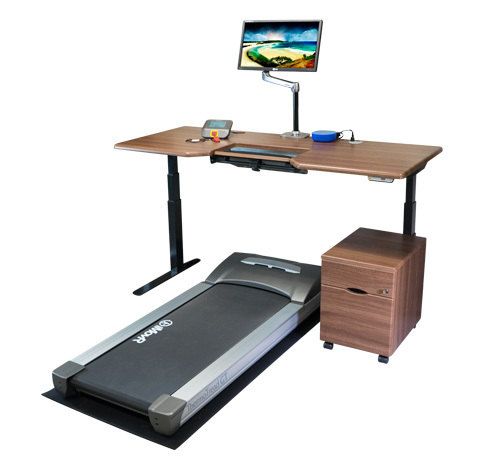 Combined, they make a treadmill desk system that is certainly worth a second glance. Of the two iMovR Freedom Desks (Energize and Cascade), the Cascade features the sturdy, built-in SteadyType keyboard platform for unparalleled typing comfort and productivity while walking. It’s extremely easy to assemble (even including a factory pre-assembly option), operates as quiet as a whisper, and boasts an industry-leading warranty. Cons: Taller users over 5’9” should purchase the 6” height extenders ($79), a popular add-on featured only on iMovR’s American-made desks. If you want an advanced hand controller and extra stability for larger width desks, the Lander is a better bet. 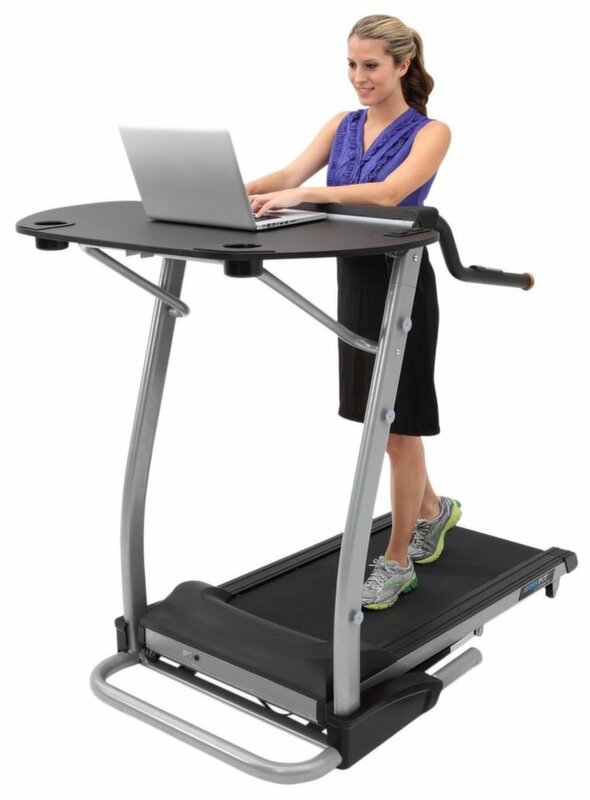 If not, the Cascade has all your treadmill desk needs covered. Pros: We haven’t seen a better desk for using with a treadmill than the Lander Desk. Its impressive stability at taller heights is enough to keep a 6’ 4” user typing comfortably with minimal work surface shaking. Its height controller is intuitive to adjust and includes a built-in health coach for developing your new walking routine. Add in an under desk treadmill like the established ThermoTread GT, and we’re looking at one of the most advanced machines designed for walking and working in the market. Pros: Sister to the Cascade, minus the SteadyType keyboard tray, this 100% American-made desk (treadmill manufactured in Taiwan, not China) is now the most customizable treadmill desk on earth. Easy assembly (as well as factory pre-assembly option), extra base color options (black, silver, and white), an industry-leading warranty, extremely quiet operation, built-in click-wrap liability waiver and 2.5 mph speed limit (which passes muster with all major employers, even 911 dispatch centers)—one can go on and on extoling the merits of the iMovR Energize Treadmill Desk…it heartily earns our recommendation. Cons: Taller users over 5’9” should purchase the 6” height extenders ($79), a popular add-on only available on iMovR desks. Desk width limited to 71” (for wider desktops see iMovR’s Energize Treadmill Desk, also made-in-USA). Pros: ModTable Treadmill Desk is really a bundle of the ModTable and the LifeSpan TR1200-DT3 treadmill base. Both well-made and versatile. Cons: Both are aging models dating as far back as 2011. You can put together a better treadmill desk. Pros: If comparing to a 2007-vintage Steelcase Walkstation the InMovement Treadmill Desk features a more updated control console setup using a small LCD screen embedded on the left side of the desk instead of a membrane keypad console that slides out from the center of the desk. It also has a fancy connector bar and cable management channel integrated into the desktop. Cons: Despite its Rolls Royce price tag this product lacks a proper ergonomic design, and offers an extremely limited option of one desktop size. It’s a one-size-fits-all design that’s got even fewer options than the 2007-vintage Steelcase Walkstation treadmill desk that it attempts to replicate. 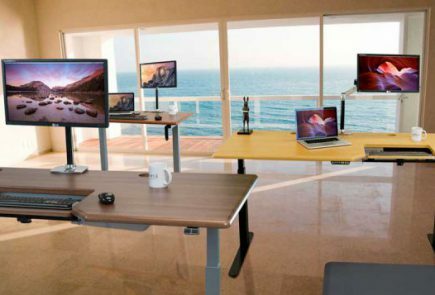 Unfortunately, InMovement also copied the WalkStation’s poor ergonomic desk setup, which means it will exacerbate “computer hunch” and increase the potential for repetitive strain injuries. Sure, there are some improvements with the embedded LCD control console and an integrated plug bar at the back edge of the desktop, but nothing remotely worth the outlandish ticket price. 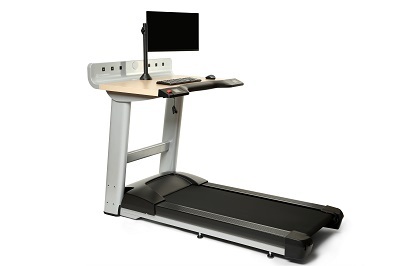 Pros: The TR5000-DT7 is LifeSpan’s top-of-the-line, multi-user treadmill desk, with a 400 lbs user weight capacity and “self-lubrication” feature. The TR5000 treadmill base has a robust AC motor that is built to endure a lot of abuse, designated for up to 10 hours of use per day. The aluminum finish is much nicer than the TR1200’s plastic side rails, which are prone to scuffing. The DT7 desk is very solidly built and has a decent height reach. Cons: The desktop of Lifespan’s DT7 electric desk—the design of which is a copy of the original 2007-vintage Steelcase Walkstation—is the least ergonomic desk on the market due to the extreme distance it places between the user and their keyboard, plus its inability to accommodate any sort of ergonomic keyboard tray. It’s a formula for “computer hunch” and repetitive strain injuries. For the $1,000 price tag you can find much nicer desks that will work much better with a treadmill, with many size and color options besides this one-size-and-color-fits-all unit that was obviously designed by gym equipment engineers. The treadmill, representing 60% of the cost of this workstation, is very yesteryear. It lacks the silent operation, smaller footprint, higher-quality components, all-digital console and future cloud connection option (CloudStation™) of the equally priced iMovR ThermoTread GT. Self-lubrication is nice but once the impregnated wax has all worn off the belt you’re facing an expensive service call for replacing it. With a continuous fan running on the TR5000’s AC inverter it is by far the noisiest treadmill you can put in an office. Pros: Prior to the introduction of iMovR’s ThermoTread GT based treadmill desks, the TR1200-DT7 was one of the most popular walking workstations sold. It combines the economy and quality of Lifespan’s most mainstream office treadmill base with their one and only model of electric height adjustable desk. 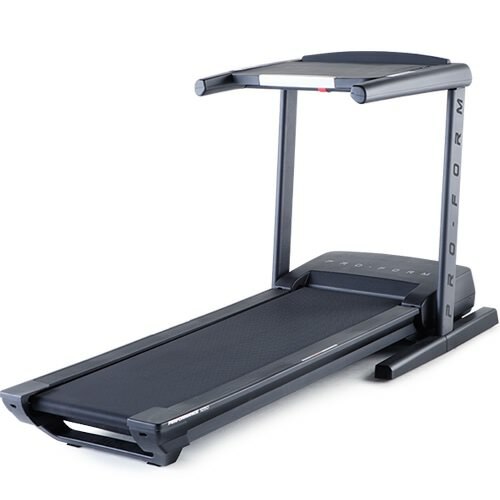 The TR1200 is well-built, and the quietest of the Lifespan office treadmill bases—with a decent 350 lb. user weight rating. The DT7 desk is very solidly built and has a decent height reach. 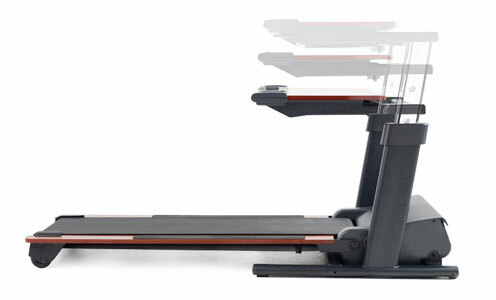 Cons: The TR1200 treadmill base was modern when it was first launched in 2011 but has since been eclipsed by much more advanced models—in particular the iMovR ThermoTread GT—that offer quieter operation, a smaller footprint, higher-quality components, an all-digital, smartphone-like control console, and robust software and cloud connectivity features and options. The yesteryear design is not one that StrengthMaster, Lifespan’s Taiwanese brand licensor, is planning to upgrade anytime soon. The desktop of Lifespan’s DT7 electric desk—the design of which is a copy of the original, 2007-vintage Steelcase Walkstation—is the least ergonomic desk on the market due to the extreme distance it places between the user and their keyboard, plus its inability to accommodate any sort of ergonomic keyboard tray. It’s a formula for “computer hunch” and repetitive strain injuries. For the $1,000 price tag you can find much nicer desks that will work much better with a treadmill, with many size and color options besides this one-size-and-color-fits-all unit that was obviously designed by gym equipment engineers. Pros: Back when treadmill desks were virtually unknwon Steelcase was the only game in town, and the Walkstation helped to spark a revolution in office fitness. Cons: The granddaddy of commercial treadmill desks, Steelcase’s vintage-2007 design is becoming antiquated compared to what can be purchased from top-rated walking treadmill and adjustable-height desk manufacturers. Steelcase pricing has fluctuated over the past year in response to ankle biting from competitors, but has remained extremely high for such outdated technology. Much better values can be had by combining iMovR or LifeSpan treadmill bases with any number of gorgeous and functional adjustable-height desks in order to achieve the perfect workstation for your needs, for $2,000 less. Steelcase is just too lazy to kill this product, and yet new competitors like InMovement (Life Fitness) are still imitating its egregiously non-ergonomic design and trying to sell their products at the same price. Pros: The TR5000 treadmill base has a robust AC motor that is built to endure a lot of abuse, designated for up to 10 hours of use per day. The aluminum finish is much nicer than the TR1200’s plastic side rails, which are prone to scuffing. The DT5 desk is very solidly built and has a decent height reach. Cons: The TR5000-DT5 is a platypus that combines Lifespan’s 400-lb user rated, multi-user treadmill with desk that is only “height-adjustable” when two people remove the pins in both legs so you can change the desk height. The DT5 desks cannot be adjusted by a single person, making it completely unsuitable as a multi-user workstation. The desktop of Lifespan’s pin-adjustable DT5 desk—like the design of their DT7 electric desk—is a copy of the original 2007-vintage Steelcase Walkstation. It is the least ergonomic desk on the market due to the extreme distance it places between the user and their keyboard, plus its inability to accommodate any sort of ergonomic keyboard tray. It’s a formula for “computer hunch” and repetitive strain injuries. For the $500 price tag, or just slightly more, you can find much nicer desks that will work much better with a treadmill, with many size and color options besides this one-size-and-color-fits-all unit that was obviously designed by gym equipment engineers. Pros: This Lifespan bundle combines the economy and quality of their mainstream office treadmill base with their pin-adjustable desk. The TR1200 is well-built, and the quietest of the Lifespan office treadmill bases—with a decent 350 lb. user weight rating. The DT5 desk is very solidly built and has a decent height reach. The desktop of Lifespan’s pin-adjustable DT5 desk—like the design of their DT7 electric desk—is a copy of the original, 2007-vintage Steelcase Walkstation. It is the least ergonomic desk on the market due to the extreme distance it places between the user and their keyboard, plus its inability to accommodate any sort of ergonomic keyboard tray. It’s a formula for “computer hunch” and repetitive strain injuries. For the $500 price tag, or just slightly more, you can find much nicer desks that will work much better with a treadmill, with many size and color options besides this one-size-and-color-fits-all unit that was obviously designed by gym equipment engineers. Pros: Sturdy exercise treadmill (though this is not useful in an office setting). Cons: The ProForm Thinline and Thinline Pro “desk treadmill” models both fall far short of our criteria for a treadmill desk, lacking the office aesthetics, work-surface stability, and ergonomic adjustability, that we expect in this category. Pros: This is the lowest-cost Lifespan treadmill desk combo, you’ll get what you pay for. Cons: The TR800 base is made in China, not in Taiwan like Lifespan’s other units, and it shows. The quality is not on par, and for $200 more we’d strongly urge any prospective Lifespan customer to upgrade to the TR1200 for its better componentry, quieter operation, and longer warranty. The 18″ wide walking belt is constraining, gritty and noisy. It’s 300 lb. user weight limit might be a stretch; we’d recommend this unit only for fairly slight individuals with a narrow-set gait. That said, it’s stronger walking base than you’ll find on the Rebel, Tread Desk or anything else you’ll find in a DIY-hacked consumer running treadmill. The desktop of Lifespan’s pin-adjustable DT5 desk—like the design of their DT7 electric desk—is a knock-off of the original, 2007-vintage Steelcase Walkstation. It is the least ergonomic desk on the market due to the extreme distance it places between the user and their keyboard, plus its inability to accommodate any sort of ergonomic keyboard tray. It’s a formula for “computer hunch” and repetitive strain injuries. For the $500 price tag, or just slightly more, you can find much nicer desks that will work much better with a treadmill, with many size and color options besides this one-size-and-color-fits-all unit that was obviously designed by gym equipment engineers. Pros: Desk top and treadmill deck have an attractive cherry laminate. Treadmill folds up vertically to save space. Cons: Desk must be swiveled to the side to fold up treadmill. Desk has too low height adjustability to be used comfortably as a sit/walk desk. Small desk top can’t support monitor arms or keyboard trays, making for poor ergonomics. More of a running treadmill fitted with a desk surface, the NordicTrack Treadmill Desk—despite being a decent running treadmill—doesn’t meet the minimum criteria for an office-ready treadmill desk. If you’re searching for a new treadmill desk, look elsewhere. Pros: No desk. Only treadmill. The treadmill is very lightweight, so the company positions it as a “portable” treadmill. Cons: The Rebel 1000 treadmill truly is “lightweight” in every sense of the word. Thin steel and corner-cutting componentry, designed to be cheap to produce and ship, but not designed to last. As of now, we cannot recommend the Rebel Treadmill 1000. Two days of lab testing left us with a severely malfunctioning unit. We like the company, and we like some of their design choices, but their first go at a walking treadmill has come up very short. In this review update two years after our first test of the product, nothing has changed to improve the quality of the product. Pros: Low price point makes it quite affordable. The impressive 400-pound weight rating (if you believe the specs) is the highest in the industry. Desktop tilts and can be folded together with the treadmill for storage. Cons: A non-adjustable desktop is permanently bolted high together with the control console that puts more distance between the work surface and the user. In addition, the short belt (40”) makes it uncomfortable for anyone over 6’. Pros: Low price point makes it very affordable. Large work surface allows for plenty of storage and writing space (when not walking). Cons: Despite being touted as a treadmill desk, it’s just in fact a desk, not a treadmill workstation that normally includes both a desk and a treadmill. Unstable, unsightly, and unsupported, the desk comes at an unreasonably high price of $650.